Surrounded by the Sierra Nevada Mountains at an altitude of 6,237-feet, Lake Tahoe is the largest alpine lake in North America. If you're passionate about outdoor activities such as hiking, biking, camping and backpacking, with some gaming thrown in, the Tahoe South area is the perfect choice for a family vacation. Mountain bikers and motorcycle enthusiasts are a special breed and the hikers relish in lost cell service. The jet skiers and para-sailors love the 191.6 square miles of Lake Tahoe. This article was written during the summer season, but it's easy to imagine the skiers and snowboarders hurtling down the snow-covered trails after riding the Heavenly Gondola to 9,136 feet. Let's not forget the ice-skating, snowmobiling and sledding. Then there is gaming, golf, tennis, fishing, horseback riding, shopping, spas, nightlife, local culture and family fun. 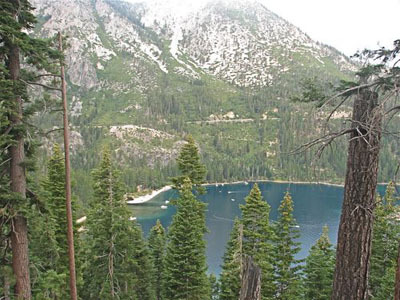 South Lake Tahoe is the largest city in El Dorado County, California, yet there are only 21,000+ souls living the good life with 39% of the area water. The California-Nevada state line area is primed for visitors with hotels, restaurants & ski resorts. Gaming is only allowed in Nevada with the casino hotels sitting smack dab on the border in Stateline, Nevada. Gaming arrived in 1944, and the city was incorporated in 1965. The 1960 Winter Olympics in Squaw Valley, California put the Lake Tahoe area on the map as a skiing region.